for clowns of all ages! In August, 1988, David Seebach wrote Article 45 for Abbott's Tops Magazine. It is basically a plea for Clowns to be Clowns and not try to be Magicians. You can read the article HERE. In this Magic Nook section of Clown Magic, you'll note that we agree with David's philosophy; Jugglers juggle, Plate Spinners spin, Magicians magish, and Clowns should clown. Our idea of "Clown Magic" is to make use of that special "magic" that only clowns can perform, by virtue of their clown-foolery. Magicians will not find most of these effects very magical. 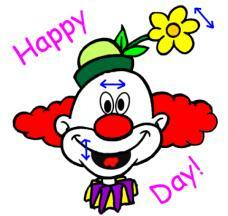 It takes a clown to bring out the true "magic" in them. 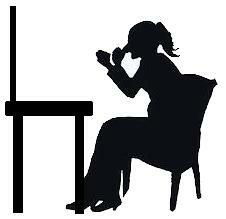 Where more information is available, click on the pictures or the INFO buttons for a further description of the effect from the article. An ordinary person walks into the little dressing room and closes the white curtain. Then a light turns on and we see only the person's shadow as he or she transforms into a clown. Once the transformation is complete, the white light becomes spinning color lights, the white curtain changes to a multi-colored design, and out walks the clown to perform a Clown Magic Show in front of the curtain. It's not what magicians would call an Illusion, but for timid young audiences, it's a non-threatening way for a clown to appear in their midst. Construction plans plus Clown Bits of Funny Business. Just because we have moved away from film cameras to digital cameras and camera phones is no reason not to bring back the old antique clown camera. It combines some science (the camera actually works like an old fashioned camera) with some clown magic fun when the pictures you "take" of audience members get "developed" and shows them as monkeys, puppies, kittens, kids (baby goats) and even clowns. This makes a good trick to end any clown magic show. The Clown Magician creates a miniature Three Ring Circus on a table top. It consists of some party cups that are striped like circus tents, polka dot balls of different colors, three metal rings, and other small props that might (or might not) be operated by invisible fleas. The e-Book described various ways to use each of the props, but the way each magic clown puts them together guarantees that everyone who performs this will do so differently. This is Gerrish's missing Clown Puppet Routine mentioned in Spellbinder's ABC Production Boxes described below. Similar to Charley Sylber's 1942 Charles' Out of My Hat, instead of a rabbit puppet, the figure used is a Clown Puppet which appears like a Jack In The Box, but with more fun, mayhem and mystery appropriate for a Clown pretending to be a magician. Construction of the box is made easy by using the same boxes as described in the ABC trick and by adapting the inner box to be more than just a production box. 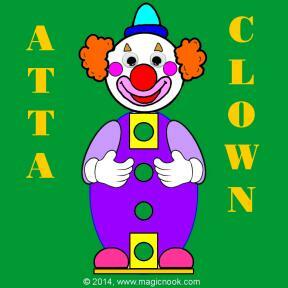 of e-Books on Clown Magic. 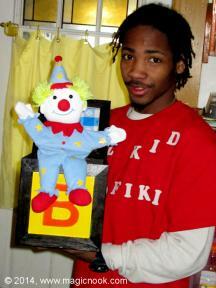 Wiz Kid Eleazar (now known as Ee-Gee-Fiki) explains how to make two-tone and three tone colored tissue paper clown hats, and describes various clown skits and clown magic that can be performed with the hats after producing them. You open an envelope and remove a greeting card. It has some kind of face on it, like a smilie face, or a clown, etc. Suddenly, the eyes on the face begin to move. The mouth opens and it begins to talk! You open the card, there's nothing inside. You show it on all sides... there's nothing to account for why the face can move its eyes, open and close its mouth, wave its hand, make words appear on the face... it must be magic! Plus a little ventriloquism on the side! The idea is based on Steve Axtell's Magic Drawing Board, but this does not require you to do any drawing, and it works completely differently, so we have Steve's permission to share it with you. It really fits inside an envelope which fits inside your pocket, and if you wish, at the end of the effect you can give the card (which you print yourself on your computer printer) to the birthday child and he won't have a clue how to make it work, but will cherish it always. Effect: A set of alphabet blocks are shown to be three empty boxes nested together. Each box is shown empty before they are stacked up, one on top of the other. Then, from the smallest box is produced a large load of production items. 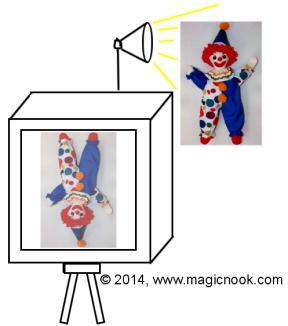 One of the items produced is a clown hand puppet large enough to fill the small box on its own. The puppet is given to a child from the audience to hold while each of the other block boxes is magically emptied of more production surprises. From the other boxes are produced various silks which attach to a PVC pipe frame, creating a small puppet theatre that the helper can use to show off the clown puppet, as you continue to produce flowers and other props that a clown puppet might use to entertain (like a squawk horn, squirt flower, etc.). The boxes are finally emptied of all their treasures. Now the clown puppet is made to disappear from the hands of the helper. Suddenly, it pops up, like a Jack-In-The-Box from the smallest block box. Professor Spellbinder's version of this combines the original Topsy Turvey Clown idea by Harold G. Beaumont (as manufactured by Jack Hughes for Supreme Magic) plus the Jumping Clown of Eric C. Lewis that he predicted would be too difficult for the average magician to build and so would never be used. With today's technology and materials (and my wizard modifications), construction is easy and you'll have an animated children's prop and routine like no other to be found in magic stores. This is a greatly simplified coloring effect that is unlike any other you can buy or make. It's a black and white line drawing on a birthday card that you send to the birthday child days before you appear at his or her birthday party. At the show, you and the child work together to magically color in the drawing on the card. When you finish, you give the child the completed and fully colored birthday card to keep and remember. It is NOT any form of Instant Art, but a regular card you can easily draw by hand or print out on your computer. In your kitchen workshop (no power tools requuired), using Howard Westgate's Tray Principle, you'll create a Clown Bus Box (decoration optional) from which you produce 12 posable Clown Dolls (production load optional). Instead of having a paid assistant holding the tray, it is held by a helper from the audience, who is none the wiser as to how all those clowns come tumbling out of the bus one by one, not to mention the additional farm animals and clown pets. I had planned to include a Hippity Hop Clown effect in the Wizards Journal #27, but this is all that and more: it is called Atta-Clown because it can also perform the Atta-Boy card trick of Jack Hughes, but with a few new twists and turns; it can serve as a billiard ball or sponge ball holder; you can perform "Forgetful Clowney" with it; the mouth can move and the eyes can move if you can provide the ventriloquism; it can make chosen cards or other "lost" objects appear in its hands. Once you make it and it's in your hands, I'll bet you think of a few more things you can do with it. You may get inspired to keep coming up with tricks it can perform, and you have my blessing to have it take over your entire show and collect your pay checks as well.